Unfortunately Gordana’s response sent me into a wave of tears of frustration. This language is so complicated with all the declensions, cases, endings, word orders that after 5 months I still do not have a friendly greeting correct. It seems that no matter how I use the language I use it incorrectly and it is causing me to be afraid to open my mouth to say anything in Slovene. By the time the answer to my simple question is completed I have forgotten the original question, and I still don’t know one consistent way to say hello. And sadly this is the process with any question about word usage. I’m feeling, as I know less now then I did in September. How is that possible? 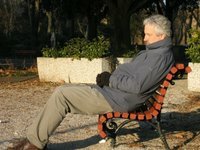 I also am still taking Italian classes for ‘stranieri’ [foreigners] in Gorizia. The class has diminished in number from about 25 to around 10 since October, and I am one of the ones hanging in. All the people in the class, except me, live in Italy and use the language daily so they are able to communicate more easily than I. They rattle on and on in Italian while I have a hard time discerning if the language that is coming out of their mouths really is even Italian. 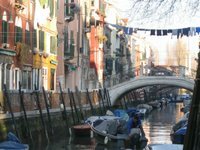 Speaking Italian with an accent from Bangladesh or China or the Ukraine sounds very different, to my ears, than the language of the teacher. She seems to understand them well, but I get that big-eyed glazed stare as my brain cells are searching and searching for something recognizable. Yet I understand the written assignments better than most and the women on either side of me are always checking my paper for understanding of the assignment, but if I try to have a conversation with them I understand nothing! I missed class twice this week because I chose not to ride my bike up the hill in the snow in below freezing windy temperatures. The next time I attended class I understood nothing! Not a thing! It was as if I was in the wrong class and they were years ahead of me in their understanding. The people around me seemed to understand the readings, while I was madly flipping through my dictionary. It was as if my brain just shut down and said “No more! Two new languages at the same time is a kind of insanity I will not support.” So the lesson learned is never miss class, study harder, watch out for strange accents, smile constantly and nod a lot. My struggle with these languages causes me to be more and more impressed with the fluency of the people around me. Gordana [my senior friend who was so shocked by my familiarity] is from a Croatian family, lives in Slovenia, takes senior classes in Italy, studied medicine after WWII in Germany, and started studying English 4 years ago when the Mormon missionaries in Italy began offering classes. She speaks Croatian, Slovene, Italian, German and English fluently. She is able to discuss subjects of great depth with me in her newest language, and I just sit in amazement. 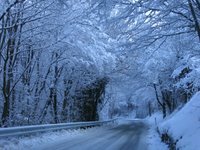 The days are getting longer and although there were gigantic icicles hanging from the drips in the tunnel this week we know that soon we will not have to wear layers and layers of clothing to keep warm on our way to town. 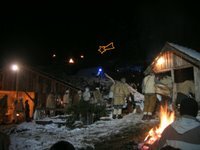 New Year in Slovenija. Sre^cno novo leto! As I write this I am defrosting my refrigerator out on the front stoop. We have a small apartment refrigerator with a freezer large enough for 2 ice cube trays [in good European tradition I no longer use ice cubes – no room]. It has collected enough ice to make a snowman. I have not defrosted a refrigerator in many, many, many years, but my recollection is that there is a drip tray that catches the water. Well not in this little gem. I have no idea where the water will go so I emptied it of the food and dragged this little baby out in the sun so I don’t have a flood in the house. We live in an upscale neighborhood and my porch is the only one proudly displaying a refrigerator. I think of this as a little bit of my down home backcountry heritage that I am sharing with the Slovenes. People greet each other everywhere with Sre^cno wishing good luck and happiness in the New Year with kisses back and forth on both cheek; 3 times. It appears that people remember whom they have and have not seen in the New Year and the greeting is shared with the greatest joy the first time a person is seen in 2006. On the first day back to school Bob was kissed more than ever in his life. The European classes have been gathering stories from their parents and grand parents to be published in English at the end of the school year. One student wrote of the ceremony the first day of school in which her father was initiated into the national socialist Young Pioneers. He wore his blue pants with a white shirt when he received his red kerchief to proudly wear around his neck. He pledged to be a good student, a good worker and to serve community and country. The socialist commitment was to reaching individual and collective potential and sounds very much like the Boy Scouts, yet this action was portrayed in the U.S. as a youth brain washing and something to fear. I remember nuclear war drills that sent us under our desks hiding our heads from radiation, or running faster than safety allowed to the school basement to crouch on the floor, knees pressed against the wall clutching our heads to our chests to protect us from the fireball that would come when the enemy attacked. This is the enemy. These people who meet us wishing us great happiness and good health for the New Year are the people we were taught to fear. These people, who as youth took pledges to care for self and country, are the face of evil and fear. I hope the Europeans have learned from the devastation of their lives, that they have looked at the history of power leading the sheep over the cliff and are choosing to create a new world that will choose peace and peaceful negotiations over weapons. America has been so very blessed with never experiencing the devastations of war, but I am afraid that those very blessings are what make us cocky and certain that we are in the right and have the justification to impose our power on others different than ourselves. During WWI the Slovenes and the Italians fought each other; they were killing their next-door neighbors. The photos in the Slovene and Italian museums are images of young men on both sides with the hope of the future before them. Youthful faces forced to promote negativity, destruction and despair, tearing gigantic holes in buildings 400 years old and starving a population they were commissioned to preserve. The leaders, the men of power and money, wanted more or wanted to protect what they had and were willing to sacrifice the peasants, the seeds of their nation, to maintain the life in which they had grown accustomed. It is no wonder that in this part of the world the movement after the war became a cry from the people for that which benefits the common good. Between the wars they Nation of Serbs, Croats and Slovenes tried to link their cultures under the Serbian king, but when the Germans smelled weakness the Partisans rose from the ranks of the farmland taking to the mountains to prevent anyone else from claiming their land. Tito was a Partisan who fought for the common people leading them to a place of unity and for the first time in 1000 years this land was under self-rule. As we are able to have conversations with people they tell us that life was better under the socialists. People were cared for, everyone had what they needed, no one had abundance, but no one was without. Families were able to provide for themselves in a variety of ways and they had a quality of life rather than a quantity of things. Now the capitalist form of democracy that emphasizes the opportunity for the individual to acquire more is robbing the culture of their independence. There seem to be more general restrictions on many things creating a greater dependency rather than greater personal freedoms. The restrictions on raising and butchering animals, making and selling wine, growing and selling vegetables is creating dependence rather than freedom. Slovenija is playing catch up with the rest of the Western world. Their desire to be modern may blind them to the pitfalls of loosing their culture, environment, and quality of life. Abundance on demand that is so prevalent in the US is available at a terrible price. In the US small markets and shops are unable to compete with large corporations, which is causing the death of our towns. We no longer know how to grow our own food or we choose to use our abundance of land for landscaping and grass rather than food, therefore we are dependant on large factory farms for vegetables and animals poisoning us with pesticides, growth hormones and genetically altered foods. The foods grown for long shelf life, so we can have anything we want out of season, are lacking in flavor, and I wonder if they also are lacking in nutritional value too. The Slovenes so far have kept the small shops all around the towns so that most everyone can walk to the market and the towns have the vitality of people walking and meeting at their neighborhood stores. The foods have brilliant flavors, the shelves have only seasonal fruit and vegetables, but the taste is more flavorful than anything I have ever tasted in the US. There is great pride in things made at home [doma]. In every home we have visited we have been offered foods produced at home, wine, liqueur, ^snops, kiwi, apples, spelt, vegetables, bread, pastries, and even a lemon for our tea picked by the priest in Ren^ce from his own tree. There is pride in most homes for that which they produce with their own hands and a great desire to share their blessings with us. The EU directives are designed to reinforce the positives of European life, but will a country this small have a difficult time keeping her head raised high? We have been traveling on Saturdays by train. 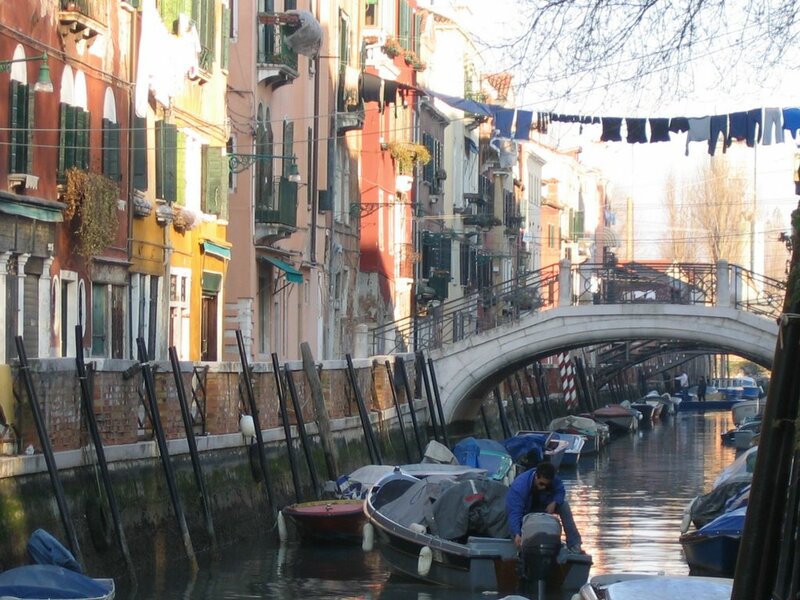 We went to Cividale near Udine on a gorgeous cold day. The city is still walled and boasts 5 churches within the walls, the oldest one we saw was built in 1121. We keep forgetting that the Italians are very serious about their afternoon lunch/family/siesta time and we arrived in town just as the market was closing up and the shops were shutting down. Most of the Italian towns we have visited have a weekly market that pulls into town early in the morning and clears out by 2:00. The tall shoe truck opens from both sides and crates are pulled off the truck and set out in the square selling shoes of all sizes and styles. When the shopping is finished the crates are piled high again in the truck designed just for this purpose. Everything fits neatly inside and the family heads off to another town for another market day. Lots of fresh seafood on ice is sold too, squid, eel, shrimp, crayfish and a wide variety of fish. At market end the ice is shoveled into the drains, the fish is bagged in plastic and all that is left behind is the scent that tells that they were there. 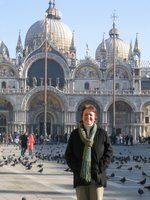 When the shops close down the streets are deserted, windows are shuttered, and we hear only our feet tripping over the cobblestones. Fortunately we can always find a restaurant to serve us food until life awakens again. The shops start to open up at about 3:30 and one by one people start to pour from their homes wearing fur coats and carrying shopping bags. The procession seems more like a fashion parade than serious shopping, or possibly a much needed walk after a big meal and a nap. 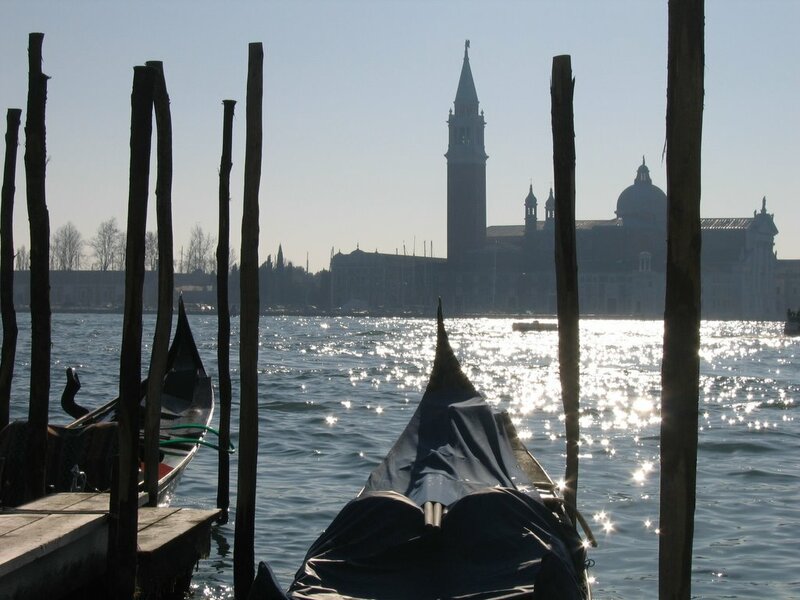 We spent another glorious day in Venice. It is such fun to climb aboard the train in Gorizia, sit on the north side and watch the Dolomite Mountains iced with snow glide by the length of the trip. 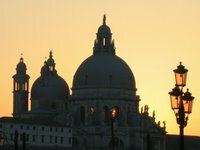 Venice was cold, but no wind and if we stayed along the promenade on the seaside in the sun we were toasty warm. 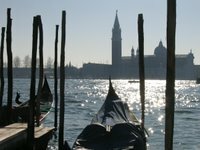 We le ft the island of San Marco, and the huge crowds, and walked around investigating Castello. There we discovered a road that is unusually wide because Napoleon filled in a canal to make a street. We saw the home of the explorer John Cabot [or Giovani Caboto as his parents named him] who discovered the coast of New Foundland, we saw where Henry James finished Portrait of a Lady, the church where Vivaldi created and performed his masterpieces, the Arsenale where the Venetian navy controlled the world and all of this is in a friendly little neighborhood where real people live. There is so much to discover!!! 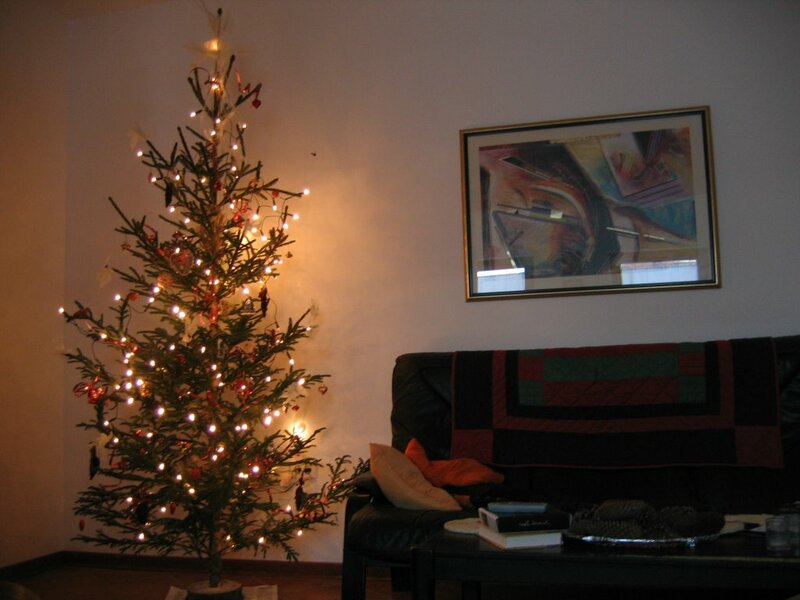 Christmas is a religious holiday in Slovenia. Santa does not come, but the baby Jesus does. 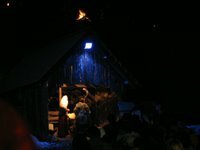 Pilgrims climb the steep switch back road up the mountain to Sveta Gora for midnight mass carrying torches and candles. At the top of the mountain boiled wine, tea and grilled meats are available along with laughter and conversation to push away the cold. Lessons and carols start in the darkness of the giant cavernous sanctuary at 11:30. 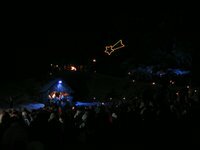 Silent Night [Sveta Noc^], along with many other familiar carols from around the world, is sung by the choir [in Slovene of course]. The mass begins with the lighting of blue lights on pine bows dangling from the top of the pillars and lights intertwined in red netting swooping down from the top of the altar giving the sense of wonder from above. The pews fill before the choir begins to sing and when mass starts at midnight people stand crushed together in the side aisles and along the back wall of the church. 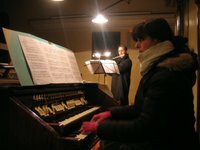 The body heat of the 800 parishioners in the freezing church sends warmth up to the choir in the back balcony, but multiple layers of clothing are a necessity to keep the chattering bones from increasing the vibrato in my sound. The priest has a terrible cold, but struggles rasping and choking the chants for those gathered to welcome the baby Jesus. The light of Bethlehem has flickered on the altar all week and now the holy family is in place on the moss carpeted nativity scene. When you drop a coin in the well the church bell rings, the water wheel goes around and the guard moves back and forth along the castle wall. Animals graze on the live moss cover and pastoral people stand frozen for generations for all to see. 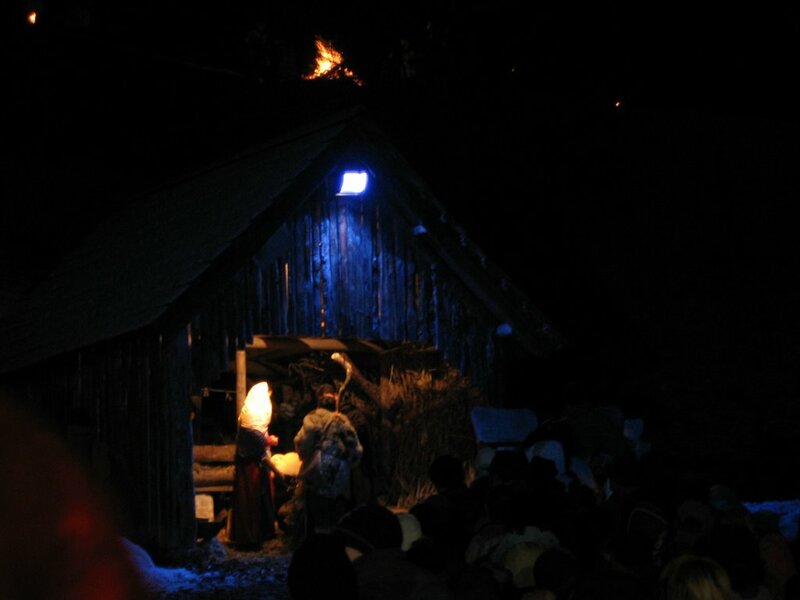 In the crooked old village of Mala Ligojna, near Ljubljana, a nativity pageant has been performed for the past 10 years. Hundreds of people gather after dark bearing candles and torches to follow Mary and Joseph as they search for a place to stay for the night. The couple stops first at the inn, but unfortunately just after a family with nine children who take every bed leaving no room for the little expectant family. Mary on her donkey, lead by Joseph, wanders down a winding road past the church to the shepherd’s settlement. Here children tend the sheep, men shoe horses, cut wood and thresh wheat, women make bread, wash clothes [in water from an icy pond], spin wool, make dolls and clothing surrounded by bon fires burning all around the village and up on the hillside. 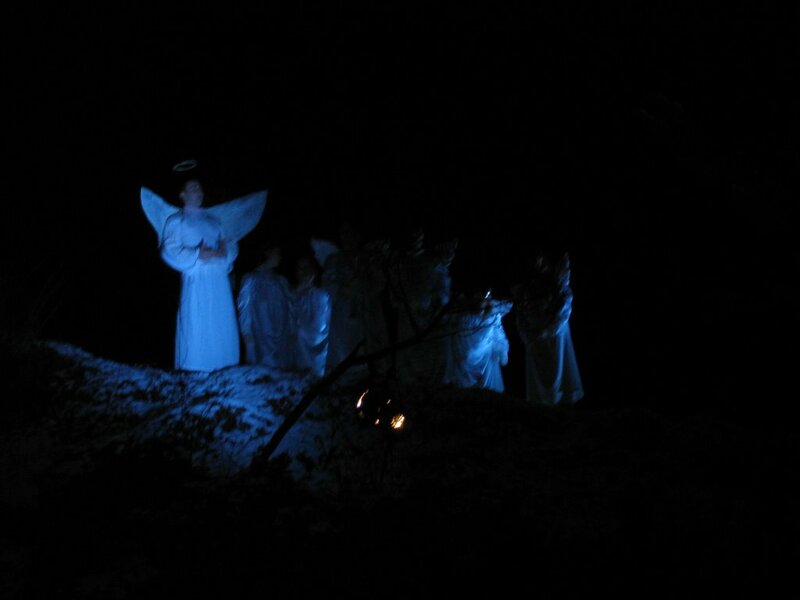 With a voice of singing the angels appear in blue light from the top of the hill dancing to the music in celebration of the birth in the stable. 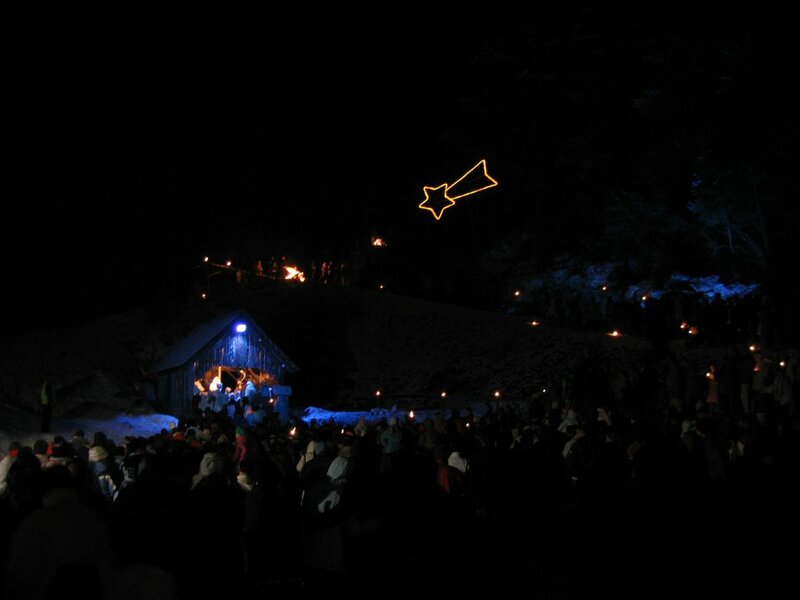 The shepherd community leaves their work running up the hill to the stable to see the miracle, and scatter when the 3 kings arrive on horseback delivering their gifts. Then all of the observers in modern synthetic clothes designed to keep us warm file, one by one, past the holy family with a real baby sleeping peacefully in the arms of his mother. The wonder and amazement was evident in every frozen breath. Despite the familiarities of the nativity story we all were silenced by the magic of the retelling on this glorious frozen snowy night. December 26 is a national day of independence. Slovene flags fly on the light poles, but there is no other indication that this date celebrates the day that 90% of the country voted to become an independent nation in 1990. It feels more like a celebration of the day after Christmas and the towns are sleepy and quiet. 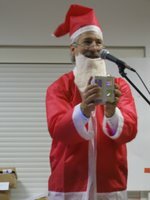 Before WWII, Slovenians celebrated St. Nicholas Day on December 5th as the time for gift giving for the children and December 25th as the birthday celebration of Jesus. After the Socialists came to power in 1947 all private enterprise was nationalized and the celebrations of Christian holidays were banned. New Years Eve became the major winter celebration with New Year’s fir trees decorating the houses and Father Frost bearing gifts. 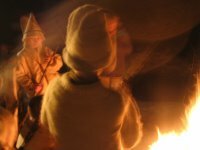 Many who were raised in the past 59 years no longer follow the teachings of the church and New Years Eve remains the primary winter celebration with family parties and gift giving. 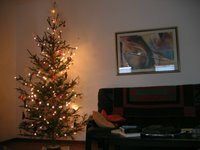 We bought a fir tree in the center of Nova Gorica. The trees here are young with open branches and tight needles along the branches that stand less than 6 feet tall. We carried the tree home from town balanced on Bob’s bicycle with both of us holding it steady and laughing at the stares we received along the way. The thin trunk is pounded into a round slab from a much larger pine tree and serves as the base. There is no expectation that trees will stay in the house longer than a couple of weeks so no one tries to preserve it in water. Throughout the fall I collected natural wonders when I walked along the railroad tracks. I tied ribbon to Japanese lanterns, sumac clusters, the seedpod of the magnolia tree, foxtail, and fluffy viney things and used them as natural decorations. I made small windmills from translucent paper, twisted red ribbon around the lights and added a few purchased ornaments to make one of the prettiest trees we’ve ever had [I say that every year]. We spent an entire day making potica and another making Christmas cookies. When we can only bake a dozen cookies at a time it takes all day to make 7 different kinds. We shared cookie trays whenever we visited with friends and family over the holiday. The rice crispy squares with ingredients sent from Ohio and the decorated cookies were the biggest hit. We have not been able to find marshmallows or Rice Crispy cereal here so the flavor is really unusual. They do not make many cut out cookies and it appears that decorating them with icing is a novelty as well. One woman asked me how I got the icing different colors, she had never used food coloring and I bought the only box in the store. American potica was a surprise to them as well. Potica is the only Slovene word that has not been translated and each kuhina is very proud of her recipe. Most of the fillings include walnuts, sugar, but also rum and lemon rind and the dough is more cake like. The potica Bob and I make every year is rolled very thin with beautiful spirals of yeast dough and walnut sugar mix and here in the birth place of potica we were constantly asked how we got the spirals so thin. Another marvel to my friends and his colleagues is that my husband assists in making the potica, not just the eating. We have a rented car for this holiday time and are spending each day traveling around our region to discover more of what is in our back yard. 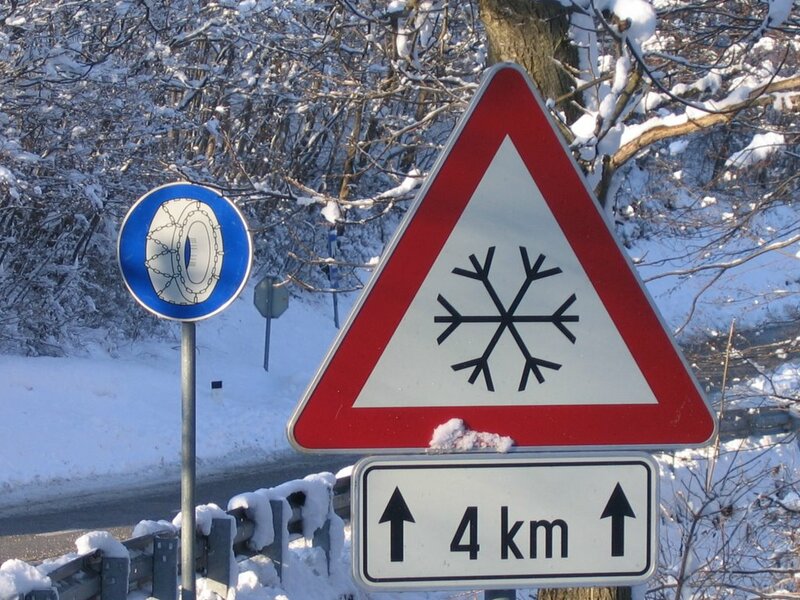 The mountains are deep with snow and the ski resorts are celebrating their good fortune. 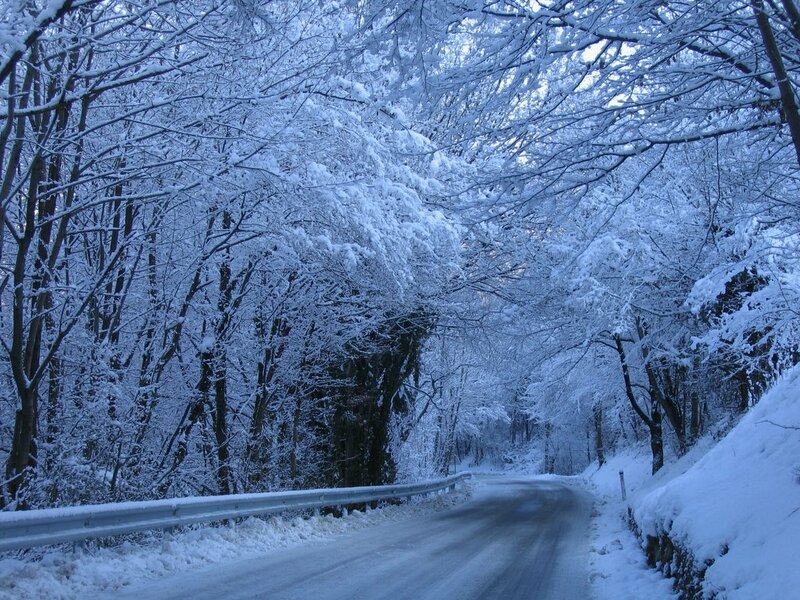 Villages in the mountains are covered under white while the trees droop heavy with fluffy crystal snow. 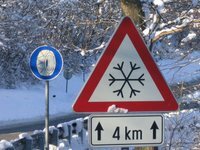 Road signs remind us that it is snowing and that since cars do not have “all weather tires” we should put on the chains. Bob is certain that if he took the tires inside the warm house with the instructions written in Italian it would still take him a month to figure out how to put the chains on. Apparently the police give heavy fines if tires are unsafely dressed, but fortunately we discovered the villages and towns with in a few miles of Nova Gorica in Slovenia and Italy with no incidents. We drive into the Vipava valley where the history of the world was changed in this place. On 6 September 394AD the two Emperors Theodosius and Eugenius from the eastern and western Roman Empire met to determine the religious fate of the Roman lands. Theodosius, a Christian, was aided in battle by the burja winds that roar through this valley at speeds up to 70 – 80 miles an hour. According to legend, the winds flew from the back of the troops of Theodosius sending their arrows deep into the ranks of Eugenius’s men whose weapons were not strong enough to fight against the wind. Following this battle the empire became more and more intolerant of the pagan faiths and embraced Christianity in greater numbers. Today the Burja winds stop truck traffic on the highway. The police force high profile trucks to park along the road, sometimes for days, until the winds stop. There are windsocks and electronic signs identifying the speed of the wind along the road and it is almost impossible to walk upright during the gusts of the burja. The town of Vipava is built on the source of the Vipava River. The water pours from under the foothills in a massive flow that instantly becomes a roaring river. A manor house once owned by the Hapsburgs cradles the river source, but sadly appears to be loosing its battle for life. Performances of operas are apparently performed in the gardens in the front of the house during the summer and I can imagine an artist colony behind these walls. Musicians and visual artists arriving to study with the masters in a beautifully restored chateau, performing concerts and gallery shows weekly throughout the summer and restoring their creative genius with fresh mountain water, local cuisine and Vipava wine. If only I had a treasure chest available to me to make my imaginings possible. 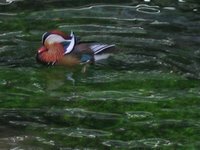 In the source of the river we saw a Mandarin duck swimming amidst the mallards [see photo]. He is the most colorful and unusual creature we have ever seen. 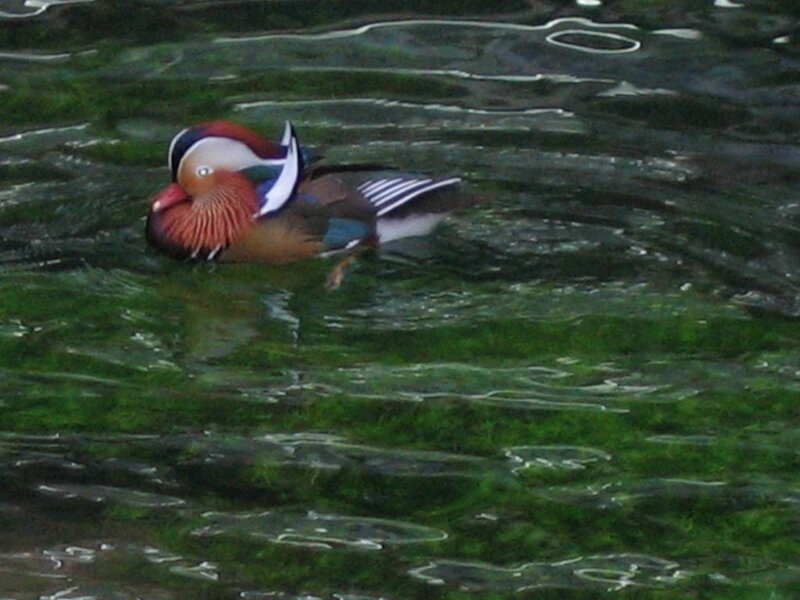 His native habitat is Korea, China and Japan, but they have recently been introduced into the fowl population in the British Isles. 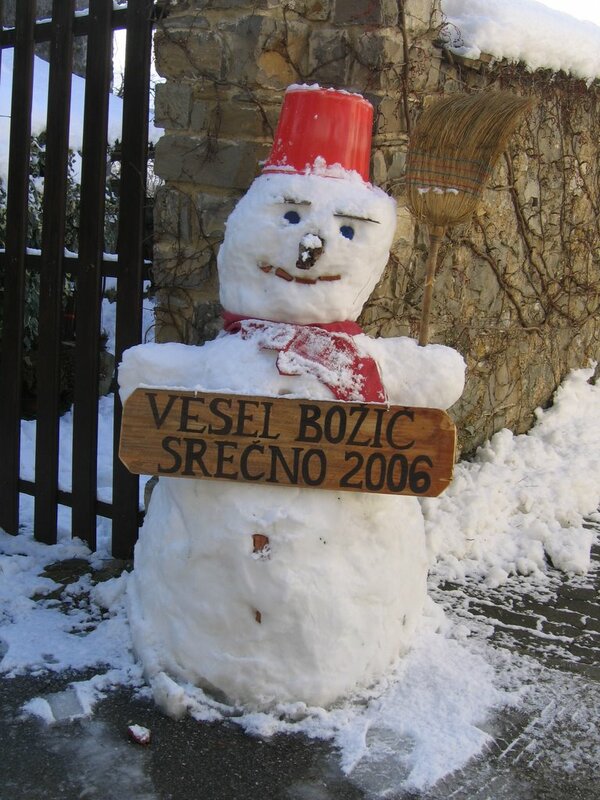 How he managed to be swimming on a snowy day in the Vipava River we will never know. We drive along the winding paths of the Gri^ska Brda and the Primor^ska regions leading from one vineyard to the next. On every inch of cultivated land the vines are planted in straight lines and terraced up the hillsides. I’m sure that working the fields for a lifetime would cause a person to have a permanent limp. The larger vineyards have trimmed the vines to the trunk with a few shoots, the smaller growers do that work in February after the cold, but all the vineyards are neat and free of fallen leaves and sticks. The smaller vineyards are struggling for their existence now that Slovenia is a member of the European Union. The legal paper work for the registered vineyards is forcing small growers to pull their name from the registry. They are required to keep a ledger of every bottle produced including those given as gifts. The detail of taxation is determined by the number of bottles produced not by those sold, which changes the spirit of creating wine and sharing it with friends and families. The local understanding is that the large wine growers of France and Italy in the EU are attempting to eliminate competition from the smaller homegrown wine makers of Slovenia and forcing them out of business. If that is the case the economy and the life style of this area will drastically change leaving this land and the villages without purpose. “There hasn’t been snow on the ground in Nova Gorica for 20 years,” yet I look out our window and see 3 inches of snow covering the red tile roofs and the palm trees. 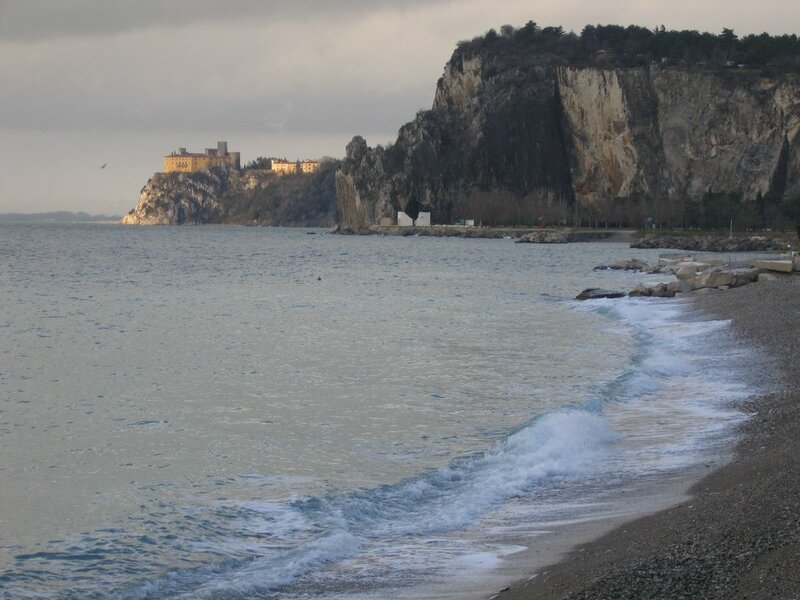 We decide to head to the Adriatic coast and the castle of Miramare up the coast from Trieste, Italy. Miramare was the home of Archduke Maximiliam of Hapsburg [eventually the Emperor of Mexico] and his wife Carlota of Belgium. 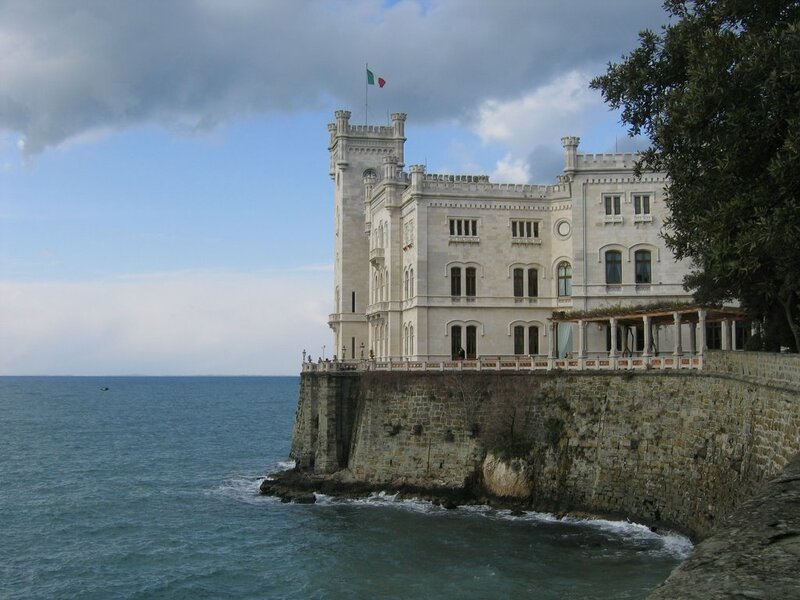 It was built on the cliffs of the Adriatic Sea between 1856 and 1860 under the specific designs of Maximilian himself. He created exceptional exotic botanical gardens on the land above the castle and humble dwellings [by Hapsburg standards] on the first floor housing the priceless items collected from their trips around the world. The setting has unobstructed views of the Adriatic Sea on 3 sides of the house, gardens in the front and a terrace surrounding the entire house providing walkways in the salt air. When he was appointed Emperor of Mexico the second floor rooms were created as public rooms suitable to his position as a world leader. Unfortunately his reign in Mexico was peppered with turmoil, rebellion and broken promises that ended in his execution. He never saw the castle finished to his specifications, and if there had been a hint that his Mexican reception was going to end so badly I think he never would have left his haven by the sea. I performed two concerts this week with flutist Armando Martiutti and organist Bernarda Pa^skvan in churches in the near by towns of Ajdov^s^cina and ^Sempeter. Armando designed the program to include many of the most beautiful pieces ever written that would be acceptable to perform in an ancient church with organ. We had an amazing audience of over 300 crowded in the ^Sempeter church. 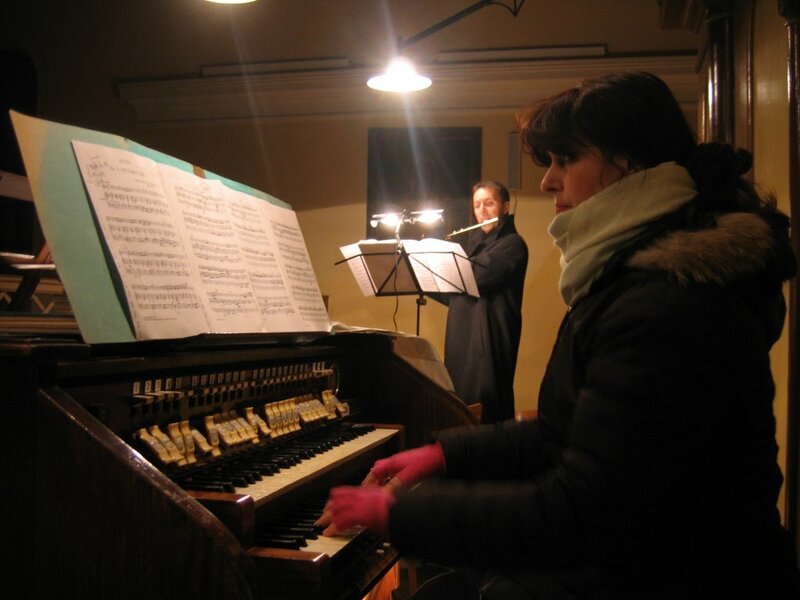 One woman who arrived late said that she likes to be comfortable when listening to music, but the performance was so beautiful that she forgot that she was standing for the entire concert in a freezing church on the coldest night of the year. I have grown so accustomed to choosing music for the palate of American audiences that I would never have programmed Bach, Telemann, Scarlatti, Cherubini, Mozart and Schubert for fear of having no one in attendance. Even when the programming is interesting there is so little chance of having a decent audience in the U.S. especially when there are other performances happening at the same time. But on this night there were large, well-advertised concerts in both Nova Gorica and Gorizia and still a capacity audience braved the inclement weather to be warmed to the soul. This was certainly the first time I’ve sung a concert wrapped in coats, scarves with the instrumentalists wearing fingerless gloves. Fortunately we stood in the back in the balcony with the organ so no one could see our odd concert attire. My student American Choir from the gimnazia sang for the end of the 2005 school year program before a respectful attentive audience of over 1,000 students and teachers. They sang, “Something Told the Wild Geese”, a peace round, and “Carol of the Bells”. One gentleman thought that they actually were an American choir because their American English was so good. We have been working at length on proper American pronunciation - no rolled R’s, an [I] sound [as in bit] rather than [i] sound [as in beet] for the letter I, the L and R produced from the back of the tongue rather than the tip of the tongue, etc. The students were very happy and proud of themselves after the response of wild applause and many congratulations for their fine performance. I too was very proud of them and pleased that their peers appreciated their hard work. The Headmaster of the school struggled with his uncomfortable English to thank both Bob and me for all that we are giving and sharing with the students at the school. His kind words were just one of the ways we are feeling so very appreciated here for our talents. It is a rare, but wonderful experience to feel appreciated. We also were included as guest performers at the staff Christmas party. 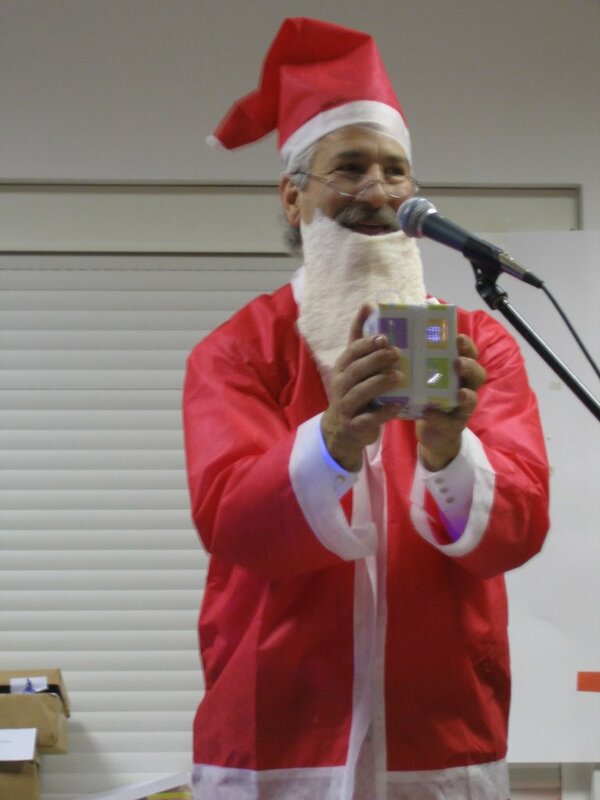 Bob played Santa Claus and I sang and lead our English conversation group in “Go Tell It on the Mountain”, “The Twelve Days of Christmas” [with motions] “Silent Night” in German, English and Slovene and “We Wish You a Merry Christmas”. I left at 12:30, Bob left at 2:30, but many of the teachers stayed dancing until 4:00am. We are discovering that these Slovenes really like to party. We crossed the doors of the Perla Casino one night to hear a concert of The New Sing Quartet. We were advised to go to the venue for the free concert at 9:00 to get seats for the 10:00 performance. No seats were available and within that hour hundreds more filed into the space leaving no room to move. [The U.S. fire marshals would be having heart attacks] The quartet is four middle age pot bellied Slovenian men who sang American Southern Baptist/AME gospel arrangements of Christmas songs and spirituals in a Casino with the ring of slot machines in the back ground. We kept shaking our heads because too many components of this picture did not jell. We of course thought we were going to hear four Slovenian men sing the rich powerful harmonies of traditional Slovenian music so listening to the Slovenian Statler Brothers was challenging to our ears. The people here love American music of all kinds and particularly spirituals, gospel, jazz and of course rock and roll. American music may be the death of traditional music around the world. We have to listen to WZIP from Akron on Saturday afternoons by Internet to hear traditional Slovenian polkas. And when we are invited to the homes of our new friends they pull out their Country Western CD’s so we will feel at home. If only they understood how disappointed Bob is to not be able to hear Slovenian songs. I found the name of a man who may be able to teach him to play the “old” songs on the button box accordion so that when we go home he can take the traditions home with him. 2005 ended with a party in our neighborhood. Five couples gathered for snacks, home made wine, champagne, fireworks and dancing. Fireworks are legal for home use during the week between Christmas and New Years, so we have been shocked out of our socks by explosions all week. One family had small and large fireworks blasting all night sending their cocker spaniel into fits of terror each time. At the stroke of midnight Gorizia filed the sky above the castle with a brilliant display that would rival any Cleveland Indians Friday night baseball game. We rejoiced with champagne, three kisses on the cheek for good luck and the greeting of Sre^cno. We danced into the morning first with Am. pop songs until Bob brought his polka CD and then everyone polkaed into the New Year. 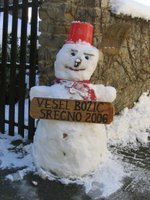 Maybe Bob will be partly responsible for the celebration of traditional music again in Slovenia. Nada and Armando in concert dress?